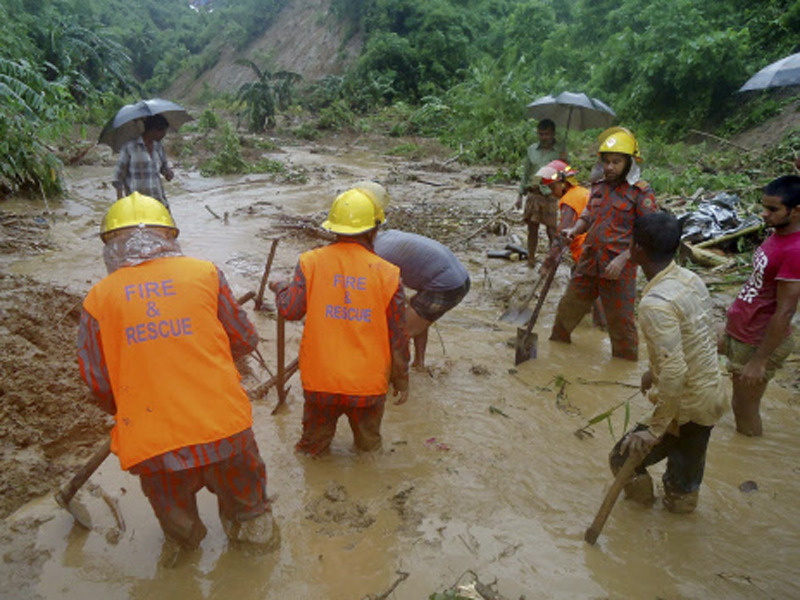 Scores of people have been killed in landslides and flooding after heavy monsoon rains battered south-east part of Bangladesh which is known as Hill tract region. A series of landslides triggered by heavy monsoon rains have killed at least 145 people, including several army officers, in Bangladesh with the majority of the deaths reported from a remote hill district close to the Indian border, officials said on Tuesday. The death toll could rise, warn officials after houses in south-east Bangladesh were buried by the landslides. Many of the victims were from tribal communities in the remote hill district of Rangamati, close to the Indian border, where 98 people were killed when mudslides buried their homes. The worst affected Rangamati hill district alone has witnessed 76 deaths, including four military personnel, who were on duty to remove the rubble to clear a major highway. It’s also badly affected Rangunia and Chandanaish upazilas of Chittagong district. Also people killed in Bandaban. Heavy rains also pounded the capital and the port city of Chittagong in the district of the same name, which experienced 222mm of rain, disrupting traffic for hours.